Have we had enough rain yet? | carpe diem! Have we had enough rain yet? I have had some fun, though. It’s Open Studios in Norfolk this month, so we declared Saturday a Holiday (he had to work Sunday) and set off to enjoy ourselves. I discovered a source of what could be very interesting dyestuff: a Norfolk farm is growing and processing woad. You can order products from Woad-inc Ltd. The woven, dyed scarves may seem expensive, but they’re Melanie Venes hand-woven and the one I saw/handled in wool and linen was both lovely and interesting, as the wool took up much more dye than the linen. The bamboo facecloth I fondled was incredibly soft, so soft I’m not certain it would suit me. I like a bit of sandpaper, I do. Saves on exfoliants 🙂 Mind you, I want to wear something as soft and warm as that! I’m told the dyestuff works well: I’ve got three skeins of undyed silk from eBay that were earmarked for dyeing one day; now I know how I’ll do it. On the left preparations for my first serious attempt at socks. Cherry Tree Supersock in Blueberry Hill, a beautiful colourway on sale at Get Knitted… I got 2 more skeins yesterday. Only one left when I checked to get that URL. Suddenly I feel lucky! According to the Twisted Sisters sockbook one should swatch socks in the round to be accurate about tension. It currently records that I’ve gone from 3mm to 2.5mm and now onto 2mm as I try to get gauge (I need to find some way of labelling this permanently). It’s on 2 circulars, which is dead easy and I think directly comparable to magic loop in terms of pattern instructions. Each time I change needles I change the pattern in some way. One needle is always stockinette, the other is currently different kinds of ribbing but as I gain confidence I’ll test some lace patterns. I’m going to keep adding to the tube as I swatch for more socks (another idea from the TS sockbook). Speaking of socks: I’ll be taking a rare trip abroad later this year. I’ve been reading about what one can and cannot take in carry-on for international flights, and I’m trying to work out how I could take a pair of socks to knit. Metal needles aka Addis seem generally to be frowned upon; circulars are better, but it still seems they’re likely to be confiscated. Denise may be disassembled into apparently harmless components (there’s a Bond sketch in there somewhere), but aren’t small enough. Perhaps I should have a travelling shawl rather than a travelling sock? I’ll try to find an Authority at BAA, but I’d be grateful for advice on this. Personally I can think of several things that one takes on board that are less useful than knitting needles and could be lethal weapons, but I may have read too many thrillers. 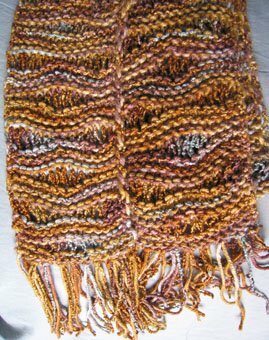 Also a swatch of Colinette Enigma in Venezia (shown below in more detail. This is weird yarn that doesn’t (to me) much resemble the photo on the Colinette site. It’s a fine-ish shiny rayon with randomly placed slubs(? is that the word?) of matte cotton, which form the prominent ‘blobs’. 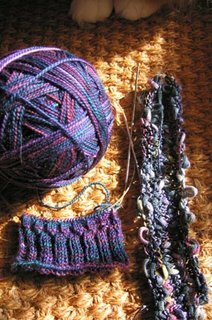 Not the nicest stuff to knit, as it doesn’t flow nicely through my tensioning fingers, the blobs make it difficult to maintain a relatively easy tension while knitting and they seem to jam and prevent ‘evening out’ by stretching the finished knit. 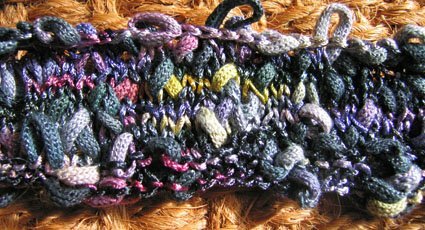 The Venezia colourway isn’t what I had imagined either, but having said all this… I’ve warmed to the yarn after seeing the swatch. The yellow is a bit strident, but the subtle shades of purple, mauve and grey are lovely. It will make a rather dressy t-shirt, I think. Speaking of t-shirts (and the plan to make one that fits) I note that Eunny Jang is promising an ‘Unraveling’ on tailoring knitting patterns to fit. That’s another seriously talented person. Oh, well, if we didn’t have goals to aim for we’d never achieve anything. Right? And a FO: I’m still working my way through the results of a major online credit card injury; this is a Wavy Scarf kit in silk bouclé and cashmere. I like what I’ve made, but I’ve used a tighter? smaller gauge than intended so it’s smaller than the suggested size. That was interesting: I started with a 6.3mm Denise (can’t remember the US size), which produced what I thought was a rather sloppy fabric. I switched to a 6mm Addi, and got something I liked much more; the difference was far, far greater than I’d expect from a .3mm difference in needle size. This experience bears out what I’ve read about needle composition affecting gauge; important to remember! This entry was posted in Uncategorized on May 22, 2006 by sarahw. From my experience, it isn’t BAA that will tell you, you can’t have the needles. It is the Transet Athority (or what ever they are called here….) I would think if you were working on something with a decent sized needle…about 3-5mm you would be safe. I wouldn’t want to go for sock size yarn. Socks are easier to carry, but there is more of a chance to be stopped and lose them. I took size 3.5mm straight needles on the plane in December with no problems….but circulars would have been better! I’ve also crocheted on the plane with no problems. Funnily enough about 2 yrs ago there was a girl doing crosstich on our flight. She was using fingernail clippers to cut the thread. I wasn’t to sure about that myself…but she got away with it! I will keep an eye on the website, I can’t remember her name at the moment but she is awesome! The work she does is staggeringly complicated! BAA isn’t the airline, it’s the company that runs the airports and he said he wouldn’t even consider taking knitting if he were me, but I could ring and ask. From what you’ve said I think I won’t bother — it would be a tragedy if I developed an emotional attachment to a sock just to have it torn from my hands by a heartless airport official. A shawl or a sleeve or something on larger needles would clearly be safer. I always used to cut thread using my teeth, but I don’t fancy a mouthful of wool. Fingernail clippers sound just the thing, I wouldn’t mourn them if they were confiscated. Thanks, Dawn!Eunny’s work is amazing, absolutely stunning, and she’s so *fast*. Sorry, forgot BAA was the company that runs the airport….duh! I think it is a smart move just to put your knitting in your checked luggage. I never have any problem with that! Look at your time on the plane as good catch up on your reading time! When I go to the states next, I’ll have saved up some Podcasts to listen to, and as usual lots of books! I was writing the next entry even as you posted that 🙂 From your experience and Dawn’s, I might try something on one of my ancient nasty circulars (the ones with scarcely any point and the cords that never straighten), taking care to thread waste yarn through whatever’s on them before check-in. How on earth do you use a drop spindle when seated? I suppose a 10-hour flight gives me lots of time to find out… I’ll repeat this query on your blog, as that’s a more sensible place for an answer, should you have time to write one!